After a long winter, the soul longs for some fun in the sun. One of the greatest ways to experience that fun is with friends. The greatest place to have that fun is in the comfort of your own back yard. Set your house up for successful outdoor barbeques and parties, and you’ll have endless summer excitement. One of the most important aspects of getting your yard ready for outdoor entertaining is adequate power supply. Some people have outlets installed for electric yard equipment like trimmers and mowers. However, outlets can be used for anything. Pellet barbecues need outlets, and so do lights and music. In today’s smart savvy world, weather resistant USB ports can also help keep the fun going all day long. Outlets will make many of the other ways to get your house ready for summer fun possible. They also eliminate work-arounds that can be safety issues. Underground conduit with a properly installed outlet eliminates extension cords hanging out slightly ajar doors and windows. This prevents electrical hazards such as damage to the cord. It looks better too. Don’t buy big yard installments like blow up movie screens or bouncy castles. Check out your rental options first. If you buy these things, they will not be worth the money spent unless you plan on having gatherings every weekend. Instead, they’ll sit in storage or in a shed collecting dust and deteriorating. Even when you do have people over, it may be too much of a pain to lug out these heavy items and set them up. Take the work and the high cost of these items and give it to a rental business. They’ll set it up, take it down, and keep everything clean. It won’t cost as much, and you’ll have a variety of items to choose from. Use your resources when getting your house ready for summer fun. If you’ve ever been to a barbecue after the sun goes down, then you know about the magic lighting can provide. Tiki torches, outdoor string lights, and even a fire pit can bring that special effect to your yard. Smart lights are now an exciting way to liven up a party, and they can be programmed to change color all from the convenience of your smart phone or other controlling device. 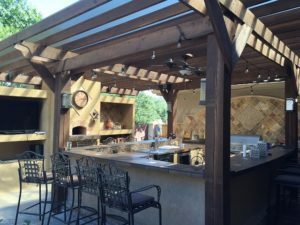 An outdoor kitchen may seem like a bit much, but ask anyone who has one. The investment is well worth it! Not only does this give you counter space for your barbecue preparation, but it gives you all the convenience of electricity and gas in one location. Roof the area, and you can have outdoor meals no matter what type of summer storms make their way overhead. Summer is all about sunshine, but it is also about protecting oneself from harmful rays. Umbrellas and even trees can be placed for convenient shade makers. If you live in a windy climate, umbrellas are a no go. If you want shade today, a tree isn’t going to grow quickly enough. There are other ways to get shade. Sun shades are one way to beat the heat with hearty pieces of thick fabric stretched tightly across a space, which makes it less susceptible to wind damage. Save your guests the trouble of sunscreen application by making sure there is enough shade. If you live at a higher elevation or desert location, it can get cool in the evening even when daytime temps soar. Consider outdoor portable gas heaters or a fire pit to give your guests something to keep them from going inside. Summer and water simply go together. This could mean beautiful fountains and swimming pools, or it could mean slip-n-slides and kiddie pools. Either way, water is a good addition to any summer get together. Squirt gun fight, anyone? If you want your party to end quickly, don’t provide seating. Nobody will get comfortable, and conversation will be…efficient. If you want a laid back, enjoyable evening, make sure there are enough seats for everyone in the house. Cozy chaise lounges and outdoor sofa sets create an inviting setting, perfect for friends and family to chat. Your guests must be entertained, and if you have a mixed crowd, they may separate into comfortable clicks. Don’t let your party become disentangled. Get everyone together with some games. We’re talking anything from some low key croquet to a high stakes game of ultimate Frisbee. Not into active games? Even some outdoor chess or card games will do the trick. Don’t forget about technology. Televisions, smart features, and smart rental choices like blow up screens with projectors can take a party from so-so to over-the-top fun. It is almost spring, and spring is the time to prep your house for warm weather fun. Start by looking at your back yard and adding some fun features where you can! BRAY Electrical Services works in all phases of residential and commercial electrical work and specializes in residential remodel as well as service and commercial. Located in Atlanta, Georgia, we happily provide service to all of the greater Atlanta metro area. We have State of Georgia Class 2 unrestricted licensed electrical contractors on staff.